All transactions are safe and secure with a reliable history in online purchasing behind each of our associates. Buy the I Drink Your Milkshake! ...I Drink It Up! t-shirt to own There Will Be Blood clothing and merchandise. 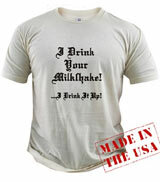 The front of this I Drink Your Milkshake shirt prominently displays Daniel Plainview's There Will Be Blood movie quote in dark Old English style font. The movie's catchphrase spread like wildfire across the internet following the film's release. In addition to tributes to the quote appearing across numerous fan web pages and forums, Kevin Kunze's YouTube video spliced together clips from the movie's trailer to Kelis' song "Milkshake." In addition to the I Drink Your Milkshake! ...I Drink It Up! tee above, browse the There Will Be Blood Clothing Gallery for more apparel like men's and women's clothes, kids shirts or hoodies.